My father, Marvin P. Hoffarth, founded Master Plan Hearing Aid Co. in the Spring of 1974. Previously, he co-owned Mayo's HearingAid Center in St. Louis Missouri. My parents, natives of St. Louis, were faced with the golden opportunity of opening a new hearing aid office in the fast growing Denver metro area. The thought of moving 850 miles away from their family caused them considerable anxiety, but after their first visit to beautiful Colorado, that feeling quickly lifted. My father was known as one of the most knowledgeable and ethical hearing aid specialists in Denver. 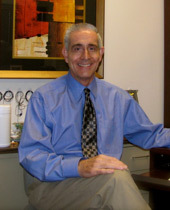 He established a lucrative hearing aid practice within a few years. Some of you may remember him from either the Colorado Blvd. or S. Albion office. He earned the respect of many ear doctors and audiologists in Colorado by dispensing hearing aids strictly prescribed through medical referral. By 1977, Master Plan Hearing Aid Co. had grown to the level of requiring another hearing aid specialist. It was then that my father offered me the opportunity of joining him in Denver. I couldn't have asked for a better teacher than my father for learning all aspects of dispensing hearing aids, and ultimately, operating a business. We gained a new respect for each other through our close working relationship. I wouldn't trade those years for anything! In 1981 my father died of heart failure. His founding attributes continue on to this day as the backbone of Master Plan Hearing Aid. Co.
A new era began in 1983 with the addition of our audiologist, Christopher Fergus, M.A., CCC-A. Chris graduated from the University of Denver with a Master's degree in Audiology, and shortly thereafter earned his Clinical Competence Certification from the American Speech and Hearing Association. Chris not only provides Master Plan Hearing Aid Co. with full audiological services accommodated by a clinically certified audiologist, but also to me personally, his good friendship. From South Downing Street to South Cherry Street, Master Plan found its new home in July of 1987. Our current location in The Forum at Cherry Creek provides ample and convenient parking, a handicapped accessible entrance with automated doors, three elevators, and a panoramic view of the Rocky Mountains. A third generation of Hoffarths entered the hearing aid profession at Master Plan when Christa Hoffarth, my youngest daughter, was hired as office manager in January of 1996. She graduated from Colorado State University with an undergraduate degree in nutrition. You will see her articles on nutrition in this newsletter The Hearing Messenger. Christa brings many smiles and a much needed state of order to Master Plan's front office. The advent of high tech computerized hearing aids this decade has changed forever the way hearing aids are fitted and our approach to hearing loss. There is no better time than now to be fitted with new hearing aids. Digital Signal Processing hearing aids provide the wearer with CD-quality sound, and can ensure that weak sounds are audible, normal sounds are comfortable to hear, and loud sounds are never uncomfortably loud. Along with the evolution of this digital technology comes many new demands for Master Plan Hearing Aid Co. Chris and I spend many hours each year attending continuing education courses which teach us the skills necessary to properly assess, select and fit digital hearing aids. Our computer hardware and software, required for the programming of these new digital hearing aids, is continually being upgraded or changed to meet the demands of the new products introduced. Digital hearing aids continuously modify sounds to match the hearing profile of the individual. They allow sound to be very precisely customized to the person's ear. Individuals who previously were fitted unsuccessfully can now have their hearing improved comfortably for all listening situations. New users of digital hearing aids are having a much easier time acclimating to better hearing. It's definitely exciting for us today being able to solve many more of the difficulties that sometimes occur from wearing hearing aids. Looking back in celebration of this milestone, we have much to be thankful for at Master Plan Hearing Aid Co., and we'd like to especially thank all of you for making it so.